Go! Go! Go! is a fun card game; although it is not extremely difficult to learn, it can be a tricky game to master because it involves skill and luck. At the beginning of the round when you press "Go! Go! Go! 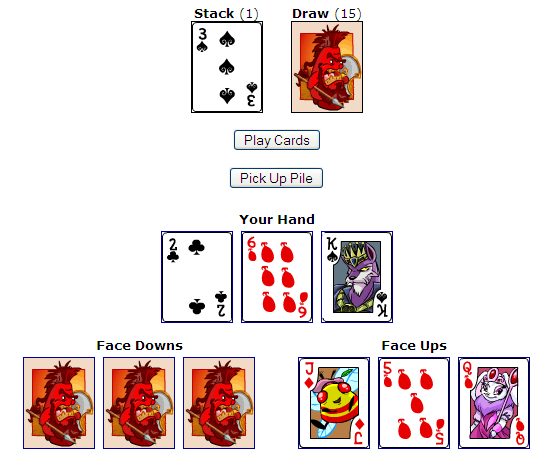 ", you get 9 cards: three "In Hand" cards, three "Face Up" cards and three "Face Down" cards, as shown in the image below. To play, you must place a card from your hand that is equal to, or greater than, the current number, aces being high. For example, if the current card is a 9, you can play a 9, 10, J, Q, K, or Ace on top of it. If you have more than one card of that type, you can play them all at the same time; so you could place two Jacks down at the same time or three kings etc. You may place a two over any card other than a three. You may only place odd numbered cards above a three (3, 5, 7, 9, Jack, King). You may only place even numbered cards above a four (2, 4, 6, 8, 10, Queen, Ace). If you place a ten on the stack, the pile clears (all the cards disappear). You can take another turn, and place any card you wish. If you complete a set (e.g. put down two kings when the last two cards were also kings), the pile clears and you get another turn. If you cannot make a legal move, you must add all the cards in the stack pile to your hand. After you have played your card(s), if you have less than three cards left, you will get another card from the "Draw" stack, unless the draw pile is empty. Then your opponents take their turns; all you need to do while they do this is watch what they play and click "Continue" until it's your turn again. Once you get rid of all the cards in your hand, you are able to play your face up cards. The face up cards work the same way, except that you may only play one card per turn. If you are unable to move, you will play your lowest numbered card and pick up the pile (so your lowest numbered card is added to your hand as well). After you have gotten rid of your Face Ups and your hand, you may play the face down cards. The face downs are really tricky, because you are unable to see what card you play, and if it happens to be an illegal move, you have to pick up the entire pile! Once you have played every card in your hand, Face Ups and Face Downs, and you are the first to do so, you will win that round and win Neopoints. You will also be able to advance to the next round, where you will face harder opponents, and (if applicable) win a trophy. If you have played every card but you are not the first to do so, you will win some Neopoints but will not get a trophy and won't advance to the next round. Here are some tips for winning that trophy! Save your twos until you really need to use them. Use tens if there are a lot of cards in the pile. If an opponent is about to win, play higher cards to reduce their chance of winning. Play your threes or fours if you are able to, as they are the hardest to play because they are low-numbered. Aces are also useful, as they can be played over anything but a three.